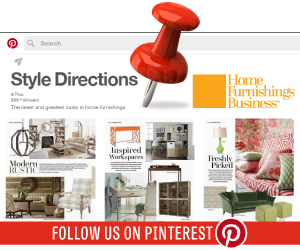 Our goal at Home Furnishings Business is to help our readers improve the performance of their business by providing critical information, so they can develop successful strategies for their company. To assist you with that process each year, the January Coach’s Corner article reviews the last 12 months of columns to give you some ideas about potential retail resolutions you can create to help your business prosper in the coming year. I recommend you review those that look interesting to you and select at least three ideas to include in your sales improvement plan for 2019. They are presented in the order they were published, but that might not be how you need to approach them. Best to select those that are most important, then prioritize them based on urgency. January 2018 – “Retail Resolutions” – Just like this column, last year’s initial issue listed the previous 12 Coach’s Corner topics. If you have not already gone back and reviewed the 2017 offerings to create your Retail Resolutions for last year, you now have twice as many potential game changing ideas you can look at for this year’s planning process! February 2018 – “Maybe It’s Time to Take the Gloves Off?” – Historically, good retailers have always known how to fight new competitors who come to their town and try to steal potential customers from them. They would analyze the things they are doing and counteract them with targeted advertising, merchandising and selling efforts. However, now we have an entirely different type of enemy to contend with, but perhaps the same approach will work if it is properly aimed at them. I am talking about the fastest growing and toughest competitors we have had in a long time, the online retailers. Most of these entities offer great selection at what appears to be competitive pricing, the two biggest concerns for most consumers. So how do we fight them and win back customers or keep from losing future ones? One of the best places to start is to look at what they are doing to hurt us. March 2018 – “Words Matter, So Be Careful Which Ones You Choose to Use” – The highly successful retailer Art Van Furniture is investing a lot of money to convert all of their clearance areas into outlets, all because of the Millennials’ negative perception of that one word. This made me think about how important the words we choose to use are in everything we do, both personally and professionally. That caused me to remember the famous standup routine the late George Carlin did in 1972. Yes, I am talking about his “7 Words You Can’t Say on TV” bit. As a result, I have put together my “Seven Words Choices You Should Say in a Home Furnishing Store” when talking with targeted consumers and staff members. April 2018 – “Are You Winning or Losing Your Market War?” – Are you winning or losing your competitive battle for share of the business done in your market? Every business needs to determine and understand this critical number because it is indeed the only true indicator of how you are performing in your market war. However, market share is heavily influenced by “share of traffic”. In fact, to a great extent, it has been the shifts in traffic that have caused the distribution channel share changes we have seen. 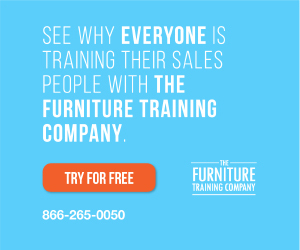 To survive, you still must do all you can to drive people in your doors, but in most markets, traffic is going to be static or slightly down for most furniture stores. Therefore, let’s go back to the basics and determine what we need to focus on to drive performance improvement in our stores that will deliver a higher share of the most important asset every retailer has – their customers. This article presents some ways to better understand and improve our “share of customers”. May 2018 – “Coaching the Coach – A Sales Management Training Overview” –Have your Sales Managers actually been trained or are they self-taught? Is their focus on providing the best customer experience possible or on putting out fires? Do they have the right systems and procedures in place or are they flying by the seat of their pants? Do they understand the role of sales metrics in the coaching process or do they just use them to punish low performers? If the answer to the first part of each of these questions isn’t yes, then there may be room for improvement in your sales management effort and as a result, your staff’s performance. This article will give you some insight into the elements we think you should have in any sales management program you either provide in-house or receive from an outside supplier. June 2018 – “Building the Perfect Beast – How to Develop Future Leaders” – Without training, including exposure to new ideas, processes and cutting-edge thinking, how can we hope to develop well rounded, professionals to take over our businesses and guide our industry? This statement got me thinking about my career and what happened in it that had the most impact on my growth, both as a person and a business professional. The biggest factor was the amount of effort my direct supervisor put into training me and providing me with opportunities to learn even more through additional educational activities outside of the company itself. The best boss took all of his direct reports to the “Success 1993 Seminar” which featured the top motivational speakers of the era, including: Zig Ziglar, Peter Lowe, Mary Lou Retton, General Norman Schwarzkopf and others. They were all excellent, but the one that really blew me away was General Schwarzkopf. His topic was “Picture a Leader” and he spoke with a clear passion that you could feel throughout the hall. This article presents some notes I jotted down from what one of our great military leaders said about being a leader. July 2018 – “Leaving a Legacy of Leadership in Your Company” – Our column last month presented some ideas about what it takes to be a leader and how to help them grow within your organization. The point being that without creating the right environment and opportunities in our companies, we will not attract, develop and retain the individuals who will evolve into the movers and shakers of the future. The recognition of the Scott Brothers as future leaders of our industry gave me an idea to help drive home this message. So, with their help, I put together a list of some important things a leader must do to be successful in their business and leave a legacy of leadership for future generations to follow. August 2018 – “What Opportunities for Innovation Might We Be Missing?” –Innovation can result from many different processes and activities. It can come from trying new things or finding different ways to use things that we already have. It can be a new way of thinking about something or a totally revolutionary idea or product. We can innovate in all facets of our lives and our businesses, which to a great extent is how we evolve and move forward in whatever we are doing and how we are living. That makes this month’s theme of “Retail Innovation”, a pretty important one. So, for this column, I thought I would provide you with a simple list of some of the “little things” I have seen people doing in our industry that have helped their businesses. September 2018 – “How to Create the Best Strategies for Your Business” – What is the difference between companies that consistently created great strategic plans and those that did not? To be honest, there were a lot of factors, but by and large, the bigger companies were able to be more organized and focused in their approach. They also had the distinct advantage of being able to put more heads around the table when brainstorming, developing and finalizing the plans. They could create multiple teams to focus on each area and aspect of the plan, so nothing got missed. The larger corporations usually had an even bigger advantage over smaller ones. 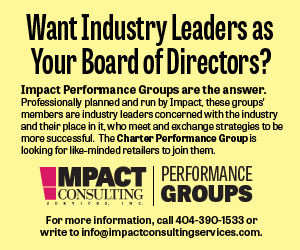 They had a board of directors, made up of successful executives from other companies who could provide a critical element to the process – an expert final analysis of the plan using experience and insight not present within the company. This article includes some ideas about how a smaller company can get this kind of assistance with their decision making and planning processes. October 2018 – “What Is the State of YOUR Industry?” – Much of what we see in big picture state of the industry data does indeed trickle down to the local level and knowing about it can give us a nice heads up about what we can be doing in our marketing, merchandising, sales and service efforts to give our potential customers what they want. However, while it is very helpful stuff to know, it is not the be-all, end-all. This type of information should influence what you do, but in order to properly plan your strategy to maximize your results, you must dig much deeper to gain a thorough understanding of what is happening much closer to home, in your backyard – your local market. That is what I call “The State of YOUR Industry”! This article walks the reader through some steps and processes they can use to determine the state of their industry, so they can create better, more effective strategic plans. November 2018 – “Where Have All the Shoppers Gone, Long Time Passing” – Our very existence is based on the process of attracting shoppers and turning them into buyers. They are the most critical ingredient in our business because without enough of this raw material, we cannot produce the sales we need to survive and prosper. We like to talk about how to get more of them to visit, however, since in recent memory most furniture stores (particularly smaller ones) are getting fewer of them then they got the year before, a very pertinent question might be: Where have all the shoppers gone? Since I have been a musician and played guitar almost all my life, when this question popped into my mind, it was quite natural for the title of a very popular folk song from my youth to join it there. Where Have All the Flowers Gone? was written by Pete Seeger and made a hit by many others, including Peter, Paul and Mary, and The Kingston Trio in the early sixties. Follow my rewrite of this great song to find out my opinion about where the shoppers have gone. December 2018 – “Proactive Planning Produces Power 50 Performances” – The big question I often get is: why do some organizations tend to always be at or near the pinnacle of their area of endeavor and others always lag behind? The answer boils down to the fact they are great at studying how they did and figuring out ways to do better in every aspect of their game or business. The best sports teams analyze each area of their game, grade every player’s performance and set targets for improvement in the next game and at the end of the year, for the next season. What training needs to take place, which players or coaches need to be replaced and how can they improve their preparation for each game, are all examined and as a result, they create plans for performance improvement. The best companies do the same thing. This article contains some thoughts that may help you move the needle next year by starting off with solid plan for what you want to accomplish.